Links to Lenten Lectionary, Great Compline, Great Canon, Prayer of St Ephrem, Life of St Mary of Egypt in multiple formats. Lenten Lectionary for all Six weeks of Great Lent and Holy Week. Four prayers on a page, suitable to print out, and cut into quarters. Themes of the Great Canon. St Andrew, Archbishop of Crete. Born in Damascus of Christian parents, he was dumb until the age of seven. When his parents took him to church for Communion, the power of speech was given to him. Such is the divine power of Communion. He went to Jerusalem at the age of fourteen and was tonsured in the monastery of St Sava the Sanctified. In his understanding and ascesis, he surpassed many of the older monks and was an example to all. The Patriarch took him as his secretary. When the Monothelite heresy, which taught that the Lord had no human will but only a divine one, began to rage, the Sixth Ecumenical Council met in Constantinople in 681, in the reign of Constantine IV. Theodore, Patriarch of Jerusalem, was not able to be present at the Council, and sent Andrew, then a deacon, as his representative. At the Council, Andrew showed his great gifts: his articulateness, his zeal for the Faith and his rare prudence. Being instrumental in confirming the Orthodox faith, Andrew returned to his work in Jerusalem. He was later chosen and enthroned as archbishop of the island of Crete. As archbishop, he was greatly beloved by the people. He was filled with zeal for Orthodoxy and strongly withstood all heresy. He worked miracles through his prayers, driving the Saracens from the island of Crete by means of them. He wrote many learned books, poems and canons, of which the best-known is the Great Canon of Repentance which is read in full on the Thursday of the Fifth Week of the Great Fast. Such was his outward appearance that, ‘looking at his face and listening to the words that flowed like honey from his lips, each man was touched and renewed’. Returning from Constantinople on one occasion, he foretold his death before reaching Crete. And so it happened. As the ship approached the island of Mitylene, this light of the Church finished his earthly course and his soul went to the Kingdom of Christ, in about the year 740. Use this for any edifying reason, but please give credit, and include the URL were the text was found. We would love to hear from you with comments. What service begins Great Lent, when is it served, and what distinctive rite is observed which is done only once a year? , being the last day that Orthodox eat cheese, any other milk product, and eggs and fish. The previous Sunday (The Sunday of the Last Judgment, or Meatfare Sunday) was the last in which meat was eaten. At the end of the forgiveness vespers is the "rite of forgiveness". The pastor preaches a short homily about forgiveness, asks forgiveness of everyone with a prostration, and everyone in turn approaches the pastor and they exchange mutual forgiveness. A receiving line is formed, so that all the faithful exchange forgiveness with each other, individually. In this way, we begin Lent having no bitterness towards anyone (if we do in our heart what we perform externally in the ceremony). What distinctive penitential prayer is said in almost every service during the Lenten season? Give the full text. You should know it by heart! O Lord and Master of my life, a spirit of idleness, despondency, ambition, idle talking give me not. But rather a spirit of chastity, humble-mindedness, patience, and love bestow up me Thy servant. Yea, O Lord and King, grant me to see my failings and not condemn my brother; for blessed art Thou unto the ages of amen..
Give the two ways in which this prayer is said in the services. Then twelve "reverences" (bows from the waist with the sign of the Cross). With each one say: God, cleanse me a sinner..
Then say the entire prayer all at once, and make a full prostration. There are some times that the prayer is said once, with a prostration after each sentence. Name ALL the services it is said, and ALL the services it is not said (paying particular attention to what day it is). The prayer of St. Ephrem is said in almost every weekday (Monday – Friday) Lenten service. Twice, with 4 prostrations and 12 bows. The Presanctified Liturgy (There are two times the prayer is said this way). The prayer is not said in Small Compline. It is also not said in the Hours following the Great Canon service (matins on the 5th Thursday of Great Lent), because of the length of this service. On weekends, it is not said on Saturday at all, or on Sunday, until after the entrance at vespers (which marks the "beginning" of the new day, Monday). Name the last time this prayer is said during before Pascha. After the presanctified liturgy on Holy Wednesday, the prayer is said after the dismissal. It is not said again in church. Name the times outside of Great that the prayer is also appointed. The prayer is said the first three days of Holy Week, at vespers and matins. There are typicons which appoint the prayer on the first day of the Apostles Fast, and of the Nativity Fast, if they fall on a weekday. What distinctive, long penitential hymn is chanted 5 times in Great Lent. Name the days, and the services it is chanted in. What else is read in the last service? The Great Canon of St. Andrew of Crete is chanted in four parts on the first four evenings of Great Lent, as part of the Great Compline service (Clean Monday – Thursday), and the entire long and compuncionate hymn is chanted as part of matins on the Sixth Thursday of Great Lent (the Thursday before the Sunday of St. Mary of Egypt). In this latter service, which is usually served on Wednesday evening, the entire life of St. Mary of Egypt, by St. Sophronius, is read in two parts. There is a service which is sung 5 times in the Lenten period, as well as several other times throughout the year . Name this service, and mention the other days outside of Great Lent that it is chanted (hint: there are usually 4 other times). There are two ways in which this service is served. Name them. The Divine Liturgy of St. Basil the Great is served on all the Sundays of Great Lent. It is also served on, St. Basil’s day (January 1st),. These services appear to be just like the usual liturgy of St. John Chrysostom, except that the Megalynarion hymn to the Theotokos is different, and the priest’s private prayers are longer. It is also served on Holy Thursday and Holy Saturday and is usually served on the prefestivals of Nativity and Theophany. These services are "Vespral Divine Liturgies", where the service begins as a vespers, and switches to St. Basil’s liturgy after the Old Testament readings. These are the ONLY times when a vespral divine liturgy is appointed, except when the Vespral Divine liturgy of St. John Chrysostom is served for the Feast of the Annunciation when it falls on a weekday in Great Lent. On all other feasts of the Lord and the Theotokos, the vigil service is served the eve of the feast and the liturgy of St. John Chrysostom is served in the morning. In all, St. Basil’s liturgy is usually celebrated 10 times in the church year. 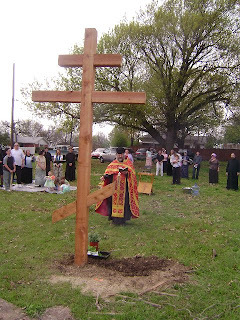 Divine liturgy is not served every day during Great Lent. What service is chanted so that the faithful can partake of the holy mysteries? Who is the author? The Liturgy of the Presanctified Gifts was written by St. Gregory the Dialogist, Pope of Rome. This service is very similar to vespers. When is the liturgy of St. John Chrysostom celebrated during the Lenten period? On Saturday and Sunday the Lenten fast is relaxed a bit, and the services are more festive, on account of the celebration of the resurrection. The services are celebrated very similar to times outside of Great Lent. The liturgy of St. John Chrysostom is celebrated on every Saturday morning (but not on Sunday, which is reserved for St. Basil’s liturgy). It is also usually celebrated on the Annunciation, and is always celebrated on Great feasts of the Lord, such as Palm Sunday. In confirming the common Resurrection, O Christ God, / Thou didst raise up Lazarus from the dead before Thy Passion. / Wherefore, we also like the children, bearing the symbols of victory, / cry to Thee, the Vanquisher of death: / Hosanna in the highest, // blessed is He that cometh in the Name of the Lord. Yea, O Lord and King, grant me to see my failings and not condemn my brother; for blessed art Thou unto the ages of ages. Amen. Before Thy cross, we bow down and worship, and Thy holy resurrection, we glorify. We read this troparion tonight, in the first of four nights of serving the Great Canon service. Unfortunately, in our church, few heard it. This is one of many poetic and powerfully brutal representations of sin which St Andrew uses, and it has always particularly moved me. I suppose it is because we are not able to easily protect our back, and it is on our вЂњblind sideвЂќ. How many sins do I commit and not see them? How easily the demons punch through my weak defenses вЂ“ often without me even knowing they are there! I also always think of the вЂњgood groundвЂќ from the parable of the Sower when I hear this troparion. We should be вЂњgood groundвЂќ and yet we grow so many tares from our passions in this ground, which is our soul. St. Andrew likens his soul here to вЂњgroundвЂќ on his back, over which the demons sow their tyranny over us. Oh! if only our soul felt the full weight of our sins, and was truly tired and disgusted with our condition! We would change immediately, I am sure, if only we could join our weak voice to St Andrew’s with complete sincerity and resolve. I welcome all your comments. Please use the link below. By the waters of Babylon, there we sat down and we wept when we remembered Sion. Alleluia. Upon the willows in the midst thereof did we hang our instruments. Alleluia. And they that had led us away asked us for a hymn, saying: sing us one of the songs of Sion. Alleluia. How shall we sing the LordвЂ™s song in a strange land? Alleluia. If I forget thee, O Jerusalem, let my right hand be forgotten. If I set not Jerusalem above all others, as at the head of my joy. Alleluia. Remember, O Lord, the sons of Edom, in the day of Jerusalem, Who said: Lay waste, lay waste to her, even to the foundations thereof. Alleluia. blessed shall he be who shall reward thee wherewith thou hast rewarded us. Alleluia. Blessed shall he be who shall seize and dash thine infants against the rock. Alleluia. You are currently browsing the archives for the Prayers of the church:Lenten Prayers category.